A luxury spread over a land area of 10.05 acre comprising of 11 towers and 1468 flats with delightful seven star resort ambience, exemplary design & planning, lush green landscape and above all, with unmatched quality standard. 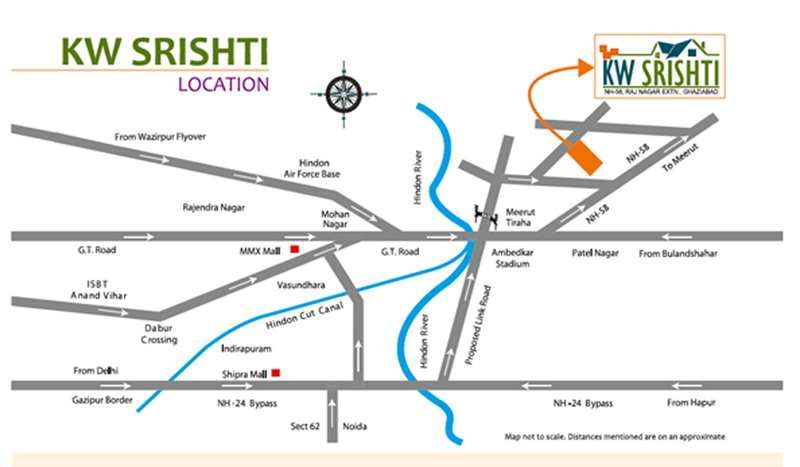 Today, KW Srishti is not just a name of a residential society, but has become a brand by itself and landmark for the entire region. The combination of amenities and facilities like emphatic entrance gate, water fall & bubbler, sculptures, musical fountain, guitar decked swimming pool, jacuzzi, grand gym, lawn tennis court, badminton court, cricket pitch, table tennis, billiard, snooker, creche, card room, TV & seating lounge, steam & sauna bath, banquet/party hall, terrace garden, amphitheatre etc., is the clear-cut distinctive declaration of KW efforts and intention of delivering a quality royal lifestyle to all its customer. Internal Doors: Massonite skin Flush door shutters painted in two Coats OF synthetic enamek paint with shutters. Main Door: European style laminated decorative polished moulded door / Laminated Door with GODREJ hardware. Guitar shape swimming pool with floating glass deck and wooden cabana. Fittings: Hot & cold water provision (pipe fitting without geyser) with CP fitting of Jaquar / Equivalent make and well mirror** shall be provided. Platform: Working platform in Black / Tan Brown / Green Granite top with Stainless steel sink. Wall: 2 feet ceramic digital tiles with exclusive central highlighter one piece dado above working platform. Flooring: Vitrified tiles (Kajaria / Surani / Equivalent) / Ceramic Tiles / Anti skid tiles. Fitting: Hot & Cold water provision (pipe fitting without geyser ) with Jaquar / Equivalent CP fitting. UPVC/Aluminium Powder Coated/Anodized windows/Hardwood frames with glass shutters.